This month, the Opera Company of Philadelphia opens their imaginative interpretation of Romeo and Juliet at the Academy of Music. But this production is seen from a new, fresh perspective that both opera lovers and fashion forward patrons will appreciate. The Capulets and The Montagues are shown as major fashion houses in a modern 21st Century world of models, paparazzi and haute couture. 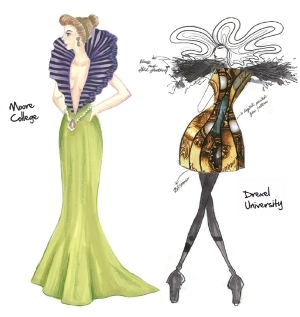 To bring this vision to life, the Opera Company partnered with three of the premier design schools in the region — Moore College of Art and Design; Drexel University’s Antoinette Westphal College of Media Arts & Design and Philadelphia University — to create cutting-edge costume design. What an incredible vehicle to cast the spotlight on all the amazing young design talent that exists here in Philadelphia! Bravo! Students at the three local design colleges were asked by costume director Richard St. Clair to create haute couture, vibrantly-colored designs that gave a nod to both Renaissance fashion and modern glitzy red-carpet silhouettes. Sixteen winning designs were chosen from each of the three participating schools to be sewn and featured in a runway fashion show within the opera production itself. The students’ designs will be previewed for the very first time at the L’Amour & Couture Gala this Saturday night at the Loews Hotel Philadelphia. The gala celebrates the production of Romeo &amp; Juliet but also the future of fashion and the power of nurturing young talent! 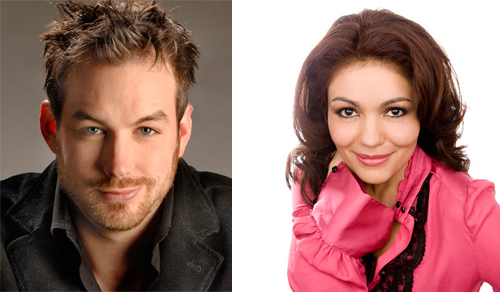 The Gala’s guests of honor and leading actors are talented vocal artists, soprano Ailyn Perez and tenor Stephen Costello. Married in 2008, both honorees trained at Philadelphia’s Academy of Vocal Arts and have gone on to thrilling international acclaim. We’re honored to be involved in Saturday’s Gala and have loved collaborating on the event design with the creative planning team at the Opera. Congratulations to Gala co-chairs Eliana Papadakis and Maria Papadakis, and event chair Ellen Berman Lee on an incredible evening celebrating art in Philadelphia! Performances of Romeo & Juliet are scheduled for February 11, 13, 16, 18, and 20 at the Academy of Music in Philadelphia. Go to www.operaphila.org for tickets and more information.